On 24 Apr. 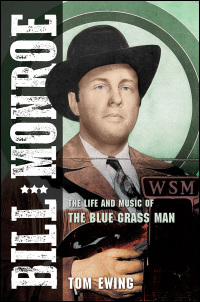 the BIB reported the welcome news, announced by Richard Thompson on Bluegrass Today, that Tom Ewing's Bill Monroe: the life and music of the Blue Grass Man was scheduled for release in September this year, in 656 pages with thirty monochrome photos, at $34.95 in hardback. Ewing’s book is, as of now, the ‘gold standard biography', and a copy belongs on the bookshelf of every real fan of bluegrass music. Those who pre-ordered it will be hoping for its speedy appearance through the post. Update 19 Sept.: Richard D. Smith, author of Can't you hear me calling: the life of Bill Monroe, Father of Bluegrass (2000) defends his biography on Bluegrass Today.